Today's report examines the large districts outside metro Denver. Boulder Valley School District: Boulder Valley has made the second largest gains in the percent of Latino students scoring proficient or better in reading, gaining 12 percentage points in 10 years. Last year, 51 percent of Latino students were proficient. As a result, the district made the biggest inroads in the gaps between Latino and white students, cutting them by 11 percentage points – 51 percent proficient vs. 87 percent. However, Boulder still had the second highest gap last year, 36 percentage points. It ranks 6th among the 20 districts for Latino gains in math proficiency. However, the gaps in math were also the second largest among the 20 districts, 38 percentage points. The school district had the biggest gap last year in reading proficiency between its low income and non-low income students as defined by eligibility for free and reduced priced lunches, 37 percentage points – 51 percent proficient for low income students vs. 88 percent proficient for others. However, the district ranked third among the 20 districts in narrowing the gap by more than 7 percentage points. St. Vrain School District: The school district made progress in raising achievement among its Latino students and closing the gaps between its Latino and white students in standardized testing. It ranked 6th among the 20 school districts in terms of the biggest jumps in Latino reading proficiency levels, rising almost 11 percentage points over the last decade to 50 percent proficient. As a result, it narrowed the gap by almost 8 percentage points in the past decade, ranking 5th among the 20 districts. However, it still had the 3rd largest gaps in proficiency levels, more than 30 percentage points. In math, the district also raised Latino proficiency levels over the past decade by 7 percentage points. But the gap between Latino and white students actually widened over the past 10 years and is the third largest among the 20 districts. The school district had the third highest gap between its low income and non-low income students in reading proficiency last year, but narrowed the gap by more than six percentage points over the past 10 years, ranking 6th among the 20 districts. About 54 percent of its low-income students scored proficient last year vs. 85 percent of its non-low income students. Poudre School District: The school district ranks in the bottom half of the largest 20 school districts, both in terms of increasing Latino reading proficiency levels over the past decade and closing the achievement gap with white students. The percent of Latino students scoring proficiency or better last year rose just over 5 percentage points since 2005 and the gap closed by almost 5 percentage points. The gap is almost 30 percentage points – 56 percent vs. 85 percent proficient – and the 5th highest among the 20 districts. Latino students in the district did slightly better in math achievement. Proficiency levels rose by almost 10 percentage points over the past 10 years, ranking in the top half among the 20 districts, but the gap only closed by a little over 2 percentage points and at more than 30 percentage points – 44 percent vs. 74 percent proficient – was the 4th highest among the 20 districts. Poudre had the 8th widest gap among the 20 districts in reading proficiency between its low income and non-low income students. About 60 percent of its low income students were proficient vs. 88 percent of non-poor students. However, the 60 percent proficiency was the fourth highest level among low income students in the 20 districts. The district closed the gap by more than 5 percentage points over the past 10 years, ranking in the middle among the 20 districts. Thompson School District: The school districts ranks in the bottom half of the 20 largest school districts in increasing Latino student reading proficiency levels. They rose about 5 percentage points over the past 10 years. It ranked in the middle in terms of closing the gaps with white students, narrowing them by almost 7 percentage points. The gap remains high, almost 24 percentage points – 53 percent proficient vs. 77 percent. That also ranks the district in the bottom half. In math, Latino student proficiency rose about 4 percentage points over the past 10 years, one of the lowest gains among the 20 districts. The gap dropped by about one and half percentage points over the past decade and remains high at almost 25 percentage points – 38 percent vs 62 percent. That is the 8th biggest gap among the 20 districts. The Thompson district had a 25 percentage point gap in reading proficiency levels between its poor and non-poor students with 56 percent of low-income students scoring proficient compared with 81 percent for other students. The gap was narrowed by only about three percentage points over the last 10 years, the sixth smallest gain among the 20 districts. Greeley-Evans School District: The Greeley school district had the fourth lowest overall proficiency levels for its Latino students last year with only 46 percent achieving proficiency in reading. However, it posted the third largest increase over the past 10 years among the top 20 districts with composite Latino scores rising almost 14 percentage points. As a result, it narrowed the reading proficiency gap with white students by more than 8 percentage points, the 4th best improvement among the 20 districts. Last year, 47 percent of Latino students were proficient vs. 75 percent for white students. The trends in math proficiency among Latino students were similar. Scores rose almost 14 percentage points over the decade, the third biggest jump among the 20 districts and the gap narrowed by three percentage points, ranking 5th among the 20 districts. Still, only 35 percent of the Latino students last year were proficient in math, the third lowest rate among the 20 districts. The district had the fifth highest gap between its low income and non-low income students last year, but ranked high in closing the gap over the past 10 years. The gap was 29 percentage points with 47 percent of poor students scoring proficient vs. 76 percent of the rest of the students. However, the district narrowed the gap by more than 6 percentage points, the sixth best improvement among the 20 districts. The district also posted a 14 percentage point gain in reading proficiency over the past 10 years among its low income students, the fourth highest gain among the 20 districts. Mesa Valley School District: The Mesa school district ranks 3rd among the 20 largest school districts in closing the reading proficiency gap over the past decade between Latino and white students. The gap has shrunk by eight percentage points as the percent of Latino students testing proficient has risen by eight percentage points to almost 57 percent since 2005 compared to 73 percent for white students. That is the 8th highest proficiency level for Latino students among the 20 districts. 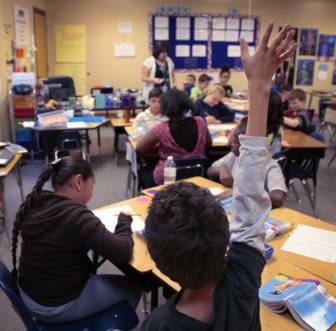 Mesa has seen comparable gains in math scores with proficiency levels rising by 9 percentage points over the decade and the gap closing by more than 5 percentage points, ranking second among the 20 districts. It now has the 4th smallest gap in math and reading among the 20 districts – 42 percent vs. 58 percent. The school district had the 4th smallest gap between low income and non-low income students last year among the 20 districts, slightly over 20 percentage points. Fifty-eight percent of is low income students were proficient in reading compared with 78 percent of the other students. The 58 percent was the sixth highest level among the 20 districts. Over the past 10 years, the district had narrowed the gap by four percentage points, ranking in the middle among the 20 districts. Colorado Springs School District: The Colorado Springs school district saw reading achievement levels increase by three percentage points over the past decade among its black students and more than 7 percentage points among Latino students, closing the gaps by three and seven percentage points, respectively. Last year, 55 percent of Latinos and 52 percent of black students scored proficient in reading vs. 75 percent of white students. That ranked the district in the middle of the 20 largest districts for Latino gains over the decade, but only 4th out of the five districts with significant black student enrollment. Black and Latino students made comparable gains in math proficiency since 2005, gaining less than a percentage point and seven percentage points, respectively. The Latino-white gap in 2014 – 41 percent vs. 62 percent – dropped by about two percentage points. But the black-white gap – 31 percent vs. 62 percent – rose by more than three percentage points. The district ranked in the middle of the 20 districts for overall Latino proficiency scores and in the middle of the five districts for overall black proficiency scores. The district had a 22 percentage point gap – 57 percent vs. 79 percent proficient – in reading last year between its low income and non-low income students, ranking in the middle of the 20 districts. Low income proficiency scores rose 2½ percentage points over the past decade and the gap with non-low income students fell by six percentage points, also ranking the district in the middle. The 57 percent proficiency scores was the seventh highest among the 20 districts. Harrison School District: The Harrison school district had among the smallest gaps and highest proficiency scores for black and Latino students among the 20 largest school districts in Colorado. The district posted similar gains in math proficiency among Latino students and to a lesser degree among black students. The district saw Latino scores rise 14 percentage points to 50 percent proficient and black scores rise 11 percentage points to 42 percent proficient. The Latino gains were the second highest among the 20 districts and the black gains were the highest among the five districts. The white-Latino gap of 14 percentage points was the second lowest among the 20 districts but it actually grew by 1 percentage point over the past 10 years. The black gap was larger, 22 percentage points, and was 4 percentage points higher than 10 years ago. Still it was the lowest gap among the five districts. In terms of overall scores, the district ranked 4th for Latino scores and 1st for black scores. At 16 percentage points, Harrison had the third narrowest gap in reading scores between its low income and non-low income students – 61 percent proficient vs. 77 percent – among the 20 districts. It closed the gap by 3 1/2 percentage points, ranking in the middle of the 20 districts. It improved low income student proficiency by 14 percentage points, the second largest increase by the districts. And its 61 percent proficiency levels for low income students was the third highest among the 20 districts. Falcon School District: The Falcon School District’s performance by its low income and black and Latino students was significantly impacted by the 2013 consolidation of GOAL Academy, an online program for mostly low income and minority students. As a result, the district had one of the largest gaps between low income and other students last year among the 20 districts and a large increase in the gap of 14 percentage points over the past decade. The district had a similar decline in reading proficiency levels for Latino students and an increase in the gap between white and Latino students over the past 10 years. However, last year, it had the second lowest gap in reading proficiency between white and Latino students – 14 percentage points. Last year, 61 percent of Latino students scored proficient as did 75 percent of white students. The 61 percent was the sixth highest level among the 20 districts. Academy School District: Academy, one of the wealthiest districts, had the highest Latino proficiency levels in reading with 78 percent of Latino students scoring proficient or better. The increase over the past decade was only 2 percentage points, one of the smallest gains among the top 20 districts, but the gap with white students, at about 8 percentage points, was the lowest among the 20 districts last year – 78 percent proficiency for Latino students vs. 86 percent for white students. The district also had the lowest gap and highest scores for Latino students in math proficiency. Last year, 60 percent of Latino students were proficient or better compared to 72 percent of white students. The district had the highest proficiency levels last year for its low income students with 69 percent proficient or better and the third smallest gaps with its non-low income students – about 18 percentage points. It increased low income proficiency in reading by 5 percentage points over the past decade and narrowed the gap by four percentage points. Pueblo City School District: The Pueblo City district was one of only three districts among the top 20 to post declines in reading proficiency for Latino students with a 1 percentage point drop to 55 proficient last year. That ranked 9th lowest level among the 20 districts. The gap between Latino and white students over the past decade narrowed by less than 1 percentage point to almost 18 percentage points – 55 percent vs. 73 percent. That was the 5th smallest gap among the 20 districts. Latino students fared worse in math with proficiency levels dropping by more than seven percentage points to 36 percent proficient or better. That was the fifth lowest level among the 20 districts. However, the gap – 36 percent vs. 53 percent proficient – remained low, almost 17 percentage points, ranking 5th among the 20 districts. The 36 percent proficiency level was the fifth lowest among the 20 districts in math. Pueblo was one of only five of the top districts to see its gap in reading between low income and other students rise, increasing by about 2 percentage points to 22 percentage points – 54 percent vs. 76 percent proficient. Low income proficient scores in reading dropped by 2 percentage points over the past 10 years, one of only three districts to post lower scores. Its 54 percent reading proficiency for low income students was the 9th lowest among the 20 districts and its 22 percentage point gap was the 6th lowest among the 20 districts. Tomorrow's post will look the school districts in the metro Denver area that are among the 20 largest school districts in the state. To read the broad story covering the 20 largest districts please click here.